This exciting tour gives you a full week of winter adventures in Tromsø, a city boasting some of best northern lights viewing in the world. Enjoy extraordinary natural surroundings, a taste of Arctic cuisine, unique Sami traditions, guided excursions in the great outdoors and free time to explore the city’s attractions. You’re guaranteed to make some lasting memories here. Arrive to Tromsø. After settling in, you have some time to explore this charming and vibrant city located 400 km above the Arctic Circle. In the evening it’s time to leave the city lights behind for a chance to enjoy some of the brightest northern lights in the world. This guided tour into the wilderness also gives you a taste of Sami culture as the guide tells tales of local folklore and customs. Spend the next five nights in Tromsø. * Please note that the Northern Lights (Aurora Borealis) are a natural phenomenon and sightings cannot be guaranteed. Have you ever wanted to learn to “mush”? After spending the morning at your leisure, it’s time to learn this traditional mode of Arctic transport with an experienced guide and a team of friendly huskies. Following a short lesson at the kennel on driving a dog sled, you’re off on an exhilarating 16 km-long ride through some of northern Norway’s most beautiful and uninhabited landscapes. At the end of the trail is Camp Tamok, where all the hungry mushers are treated to a tasty feast inside a lavvu (Sami tent). 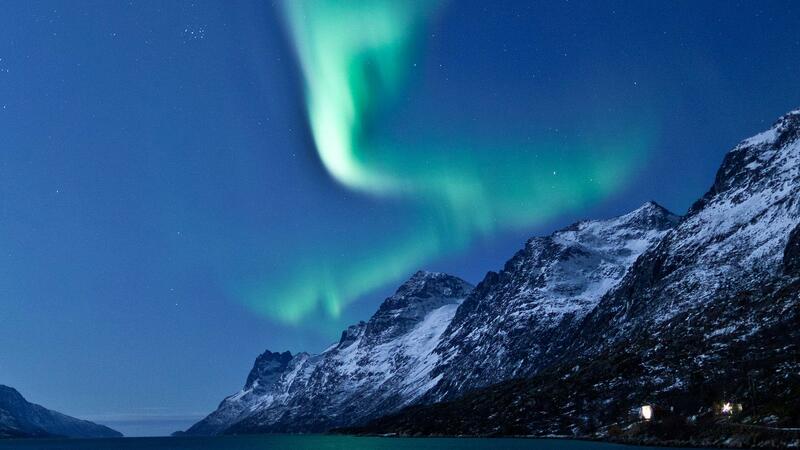 If you’re lucky, the northern lights may even make an appearance! 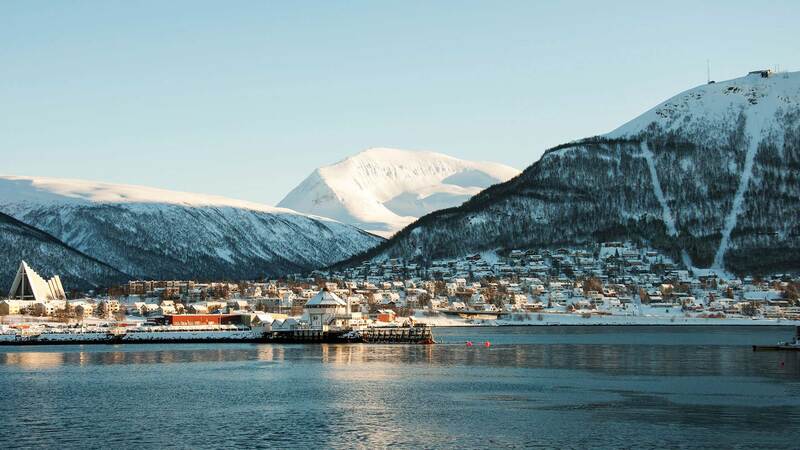 Explore Tromsø at your leisure today. 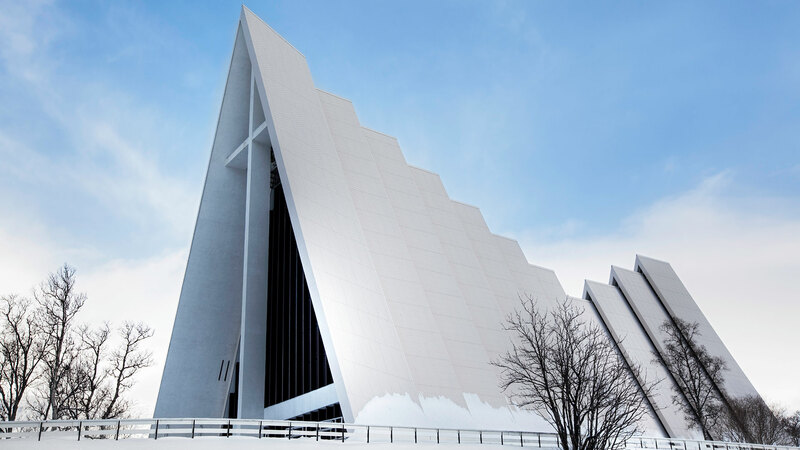 Notable attractions include the Polar Museum, the Art Museum of Northern Norway and the Arctic Cathedral. For a fantastic bird’s eye view over the city, it’s well worth a ride up to Mt. Storsteinen (421 m/1382 ft) on the Fjellheisen cable car. There are also plenty of exciting optional activities to choose from in Tromsø and the surrounding area, including guided walking tours and other city sightseeing excursions, tours of the “world’s northernmost brewery”, cross-country skiing, ice fishing, snow shoeing and more. These can be booked locally or in advance through Nordic Visitor. 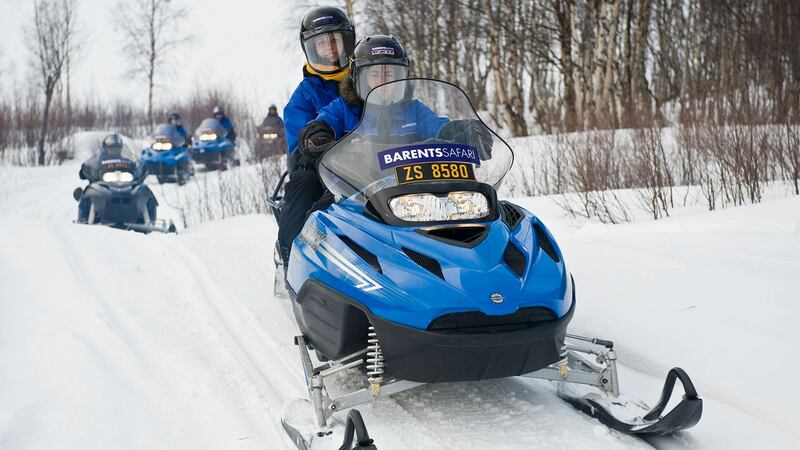 Start the day with a snowmobile safari into the Arctic wilderness. Led by an experienced guide, this excursion brings you up to heights of 875 metres above sea level with spectacular views of the Tromsø area. You might even have a chance to try your skills at ice fishing on the frozen lake on top of the mountain, if time and weather permit. 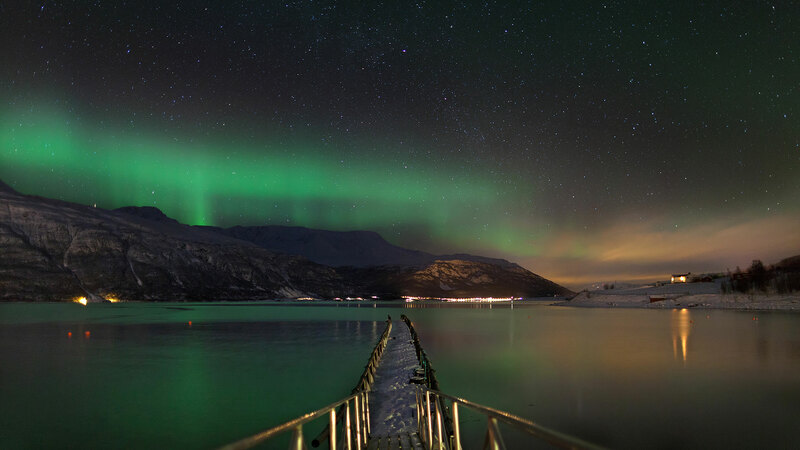 From the tour’s final destination, the Camp Tamok wilderness area, return to Tromsø to spend the evening as you wish. Enjoy the early part of your day as you wish. Later in the afternoon, board the Bellvik ferry for an informative evening cruise. With various ports of call at small villages that date back to the Viking age, you will be entertained with the guide’s descriptions of the local history, customs and folklore. This is also a great opportunity for more aurora spotting! Late night refreshments are included in this excursion. Hats, gloves, scarves and thermal layers are highly recommended. It’s time to head home after your adventurous week in Arctic Norway. We recommend transferring by taxi (only a 10 minute ride) to Tromsø Airport in time for your flight to Oslo Gardermoen Airport, where you will fly onwards to your final destination. This was my second trip with Nordic Visitor, and the quick responses, willingness to help you get all you need to have the best possible vacation make Nordic Visitor a reliable, delightful travel partner in Scandinavia. We had excellent experiences with all of the service providers. Sara and subsequently Petra provided excellent information and advice electronically for we Australian travellers. All responses to our questions and requests were immediate and well detailed. Iceland will be next on our destination list. My husband and I had a very pleasant experience with Nordic Visitor, our enquiries were responded in a prompt manner, we were able to tailor make our own itinerary according to our need, hotels were great quality and in great locations as well. What we would recommend is to provide maps for each cities in advance so we can figure out our route to the hotels/ attractions (we could jump on google maps but we found the tourist maps we got at the tourist info centers were a lot more useful). We would also like to express our gratitude to Bjarni and Helena for their assistance while we had some little issues in Norway. Bjarni was not our travel consultant but he was extremely helpful while Helena was away and managed to organise our lugguage transfer in just a few hours time while we had no idea what we could do in Oslo. Our Norway in a Nutshell trip was cancelled due to a freight train being stuck on the track and we were able to get our refund in a very timely manner. We think the service we received from the beginning to the end of our trip was excellent, Nordic Visitor and their consultants make sure their customers get the best out of it and are being well looked after during their trip. Thank you very much. Hotel Choice was excellent, best hotel I have stayed in and the best breakfast as well. The tours/excursions that were picked/included were very good, especially the Northern lights tour with Arctic Fishing Tours. They took you in a mini bus away from the weather into Finland to get good skies, provided warm weather gear, tripods, took you snow shoeing, took your photos with the lights on their camera and put them in a drop box for collection later along with a map of where you went and you got dinner as well. Very good experience much better than going on an over crowded coach style tour....My travel consultant Sara was excellent and provided very good service. Kolbrun was extremely helpful and efficient, answering my queries promptly including a question about our vouchers which arose whilst we were in Norway. We were very impressed. The trip was a 40th birthday present for me and my husband, with our children, and we all thoroughly enjoyed it - even more than we had expected to! Transportation is provided to/from Tromsø for all scheduled day tours/activities, and pickup locations will be specified in your detailed itinerary. Protective outerwear and safety gear (e.g., helmet, overalls, etc.) 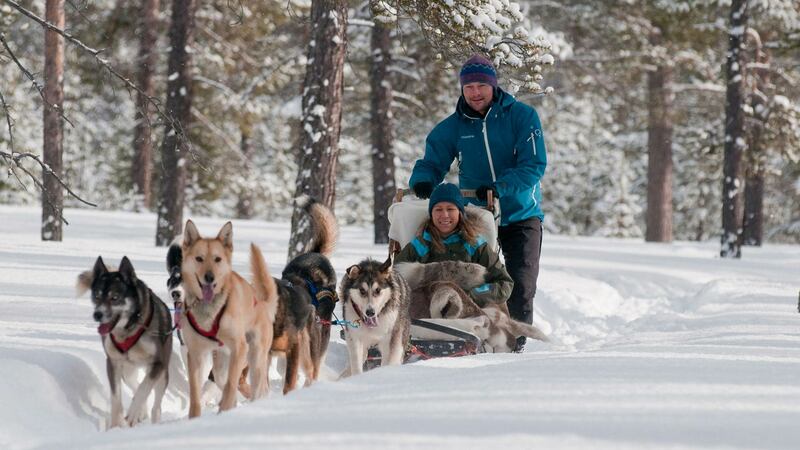 is provided locally for outdoor activities like dog-sledding and snowmobiling tours. Nonetheless, it is a good idea to bring a warm winter parka and trousers, plenty of thermal layers, a pair of insulated boots and insulated gloves/mittens, hat and scarf.